Europe has always been the worlda��s beloved cultural and historic travel destination. But its beautiful cities can also be hunting grounds for food-loving travellers searching for memorable gastronomic experiences. Here are four European cities, and food-and-drink related things to do while visiting them. 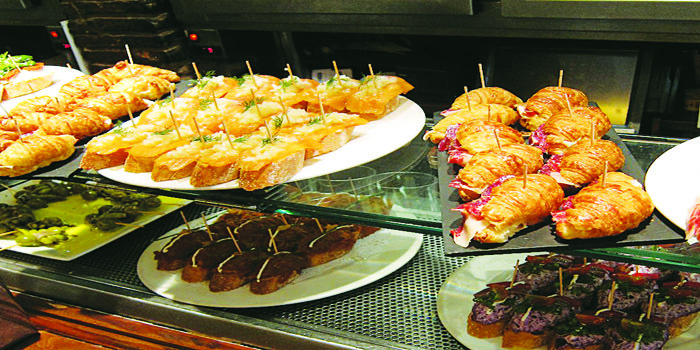 You have heard of Spaina��s tapas, but the spike-topped pintxos (pronounced pinchos) of Basque country are really where the story started. San SebastiA?n, the beautiful seaside town famous for Michelin-star dining and film festivals, is the home of the pintxo. The narrow by-lanes of the Old Town or Parte Vieja are lined with pinxto bars featuring delicacies like stuffed sea urchins and pistachio-encrusted blood sausage. 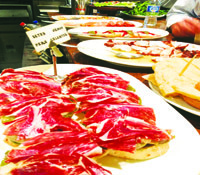 Pick small plates of tapas (euro 2-5 each) from the bar top, eat, drink, and move on to the next. Wash it down with a glass of txakoli, the dry acidic slightly frizzante white wine of the region, or sidra (cider). Wind up at La ViA�a for their famous creamy Spanish cheesecake. Bar smart: Visit Borda Berri (FermA�n CalbetA?n 12),La Cuchara de San Telmo (Calle 31 de Agosto, 28), Goiz Argi (Calle Fermin Calbeton 4), Txepetxa (Calle Pescaderia 5), La ViA�a (Calle Agosto, 31). Or book a pintxo-tasting walkabout in San SebastiA?n with sansebastianfood.com (euro 95 all-inclusive, for a three-hour bar-hopping spree) or tenedortours.com. 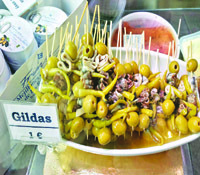 Dona��t miss: The popular pintxo called Gildaa��skewers with anchovies, olives and green peppersa��is named after American actress Rita Hayworth.A�For the adventurous: The polpo (octopus) at Borda Berri is justifiably famous. There is so much to do in Paris, food wise. For a change, skip the brasseries, Michelin stars and chic cafA�s for a classic Parisian pA?tisserie trail. Start with LadurA�e (laduree.com) on the Champs A�lysA�es, where the famous macarons of Paris are sold in their thousands every day (euro 3-5). Stop for Ispahans (rose-flavoured soft macaron biscuits) at this classic French salon de thA�. Move on to Fauchon (fauchon.com), the A�picerie and cafA�, for a quick cafe and Megeve, a dark chocolate and meringue concoction (euro 6.50), or foie gras or Paris ham and PA�rigord black truffle sandwich (euro 12), with champagne. Then, hit the Angelina tearoom (angelina-paris.fr) at Rue de Rivoli to try their famous chestnut cream covered Mont Blanc pastry (euro 8.40). 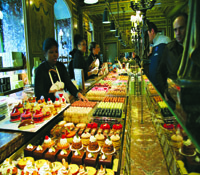 If grand Belle Epoque pA?tisseries are not for you, Paris is full of wonderful smaller ones. Like the legendary Pierre HermA�a��s (pierreherme.com), where a range of sweet delights by Francea��s most decorated pastry chef awaits you at his tiny boutique at Rue Bonaparte. HermA�a��s concoctions are often referred to as gastronomic art; visit to discover why. Dona��t miss: The Parisian hot chocolate at the salons de thA�. Decadent. The Czech are proud of their pivo (beer). They call it a�?liquid breada�� and drink 160 litres of it per head, annuallya��the highest in the world! In Prague, try a pub and brewery crawl and you will never be boreda��or sober. From the microbrewery PivovarskA? 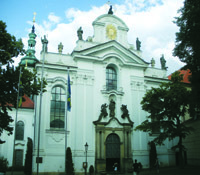 dum (brewery house), which offers classic popular choices, to brewery-hotel U MedvA�dk, pub U Provaznice (The Ropemakera��s wife, with an interesting story too), and St Norberta��s monastery-brewery, where limited quantities of dark and amber beer are made at the citya��s highest brewery at Prague Castle. Prices from euro 1 – 4. Incidentally, be aware that the numbers on the beer bottle do not refer to alcohol content, as elsewhere, but degrees representing the malt extract in the beer. The higher the figure, the more full flavoured the beer. Popular commercial brands include Kozel and Pilsner Urquell. Dona��t miss: St Norberta��s dark beer (special lager) at Strahov Monastic Brewery (klasterni-pivovar.cz), euro 4.50. For the adventurous: Try all 30 beers available at the Prague Beer Museum (DlouhA? 46, Prague 1), including pilsners, Indian pale ales, dark lagers, English pale ales, wheat beer and a range of exotic fruit beer.